"Central has some good players and they were going to come up with some big plays," said Lake Oswego junior defensive end Marshall McGuire said. "But our defense settled down and we weren't giving up anything there at the end." With the win, the Lakers advanced to the state semifinals for the second straight year; the Lakers will face fourth-seeded Metro League champion Jesuit in that game, set for noon Friday at Hillsboro Stadium. Jesuit beat Tigard 23-22 in their quarterfinal. The Crusaders are also 11-1, their only defeat a 20-16 setback to the Lakers back on Sept. 7. "It was the best feeling in the world, knowing that we were heading to the semifinals," said Lake Oswego senior quarterback Jackson Laurent, who completed 16 of 19 throws for 250 yards and two touchdowns. With the victory, the Three Rivers League champion Lakers won for the eighth straight time and improved to 11-1 overall. No. 8 Central Catholic, meanwhile, saw its two-game winning streak snapped and ended its year at 7-5 after previously finishing second in the Mt. Hood Conference. "After playing from behind the whole way, we were excited heading into halftime," said Central Catholic junior wide receiver Jaden Fulsher, who made three catches for 37 yards. "We just didn't get it done in the second half and came up a little short." The fourth quarter started with Central Catholic approaching midfield and looking for a go-ahead score and facing a 28-24 deficit. Facing third-and-3, quarterback Cade Knighton dropped back and launched a deep throw toward the visitor's sideline. All-league receiver Silas Starr reached out and had the over-the-shoulder catch in his hands at the Lakers' 30-yard line when Lake Oswego cornerback Thomas Dukart reached in and knocked the ball loose to force an incompeltion. The Rams sent the punting unit onto the field, but the up man took the short snap and fired a throw 20 yards downfield. The only problem? There wasn't a Ram in the area. The ball skidded off the turf, and Central Catholic's coaches pleaded with the officials for a holding penalty, claiming that the Rams' intended receiver got held up at the line of scrimmage. But no flag was forthcoming and Lake Oswego took over on Central's side of midfield. The Lakers quickly moved into the red zone. Laurent hit junior running back Casey Filkins on a slant pattern on third-and-11, but he was brought down just short of the marker. A false start penalty pushed Lake Oswego back to fourth-and-6, but the Lakers were intent on scoring and kept the offense on the field. Laurent stepped up in the pocket and found Filkins breaking free over the middle. He caught the ball and went untouched 19 yards into the end zone to put the Lakers up 35-24 with 6 minutes, 32 seconds to play. "That's a route that we've always had in the playbook ready for big situations," Filkins said. "If we got man-to-man coverage, we knew it would work. Jackson did a great job buying time for a route that takes a little longer — really, it goes back to summertime workouts catching all those balls." Down to its final drive, Central Catholic converted a fourth-and-4 deep in its own territory, but the Rams wouldn't make it beyond their own 30. McGuire crashed in for a sack that brought up fourth-and-18, and Knighton was forced to throw deep on his next throw — a pass that got lost between receivers and ended up with Dukart pulling down an interception. Lake Oswego picked up one first down and was able to run out the remaining time. Next up, the Lakers get another chance to reach the state championship for the first time since 2012; the Lakers dropped a 49-27 decision to South Medford in its 2017 semifinal appearance. "They have some good wins, and we picked up a big one tonight — we'll be ready for the challenge," McGuire said. "We barely got by them the first time, and I'm expecting another good game," Laurent said. "We're excited to get them again." 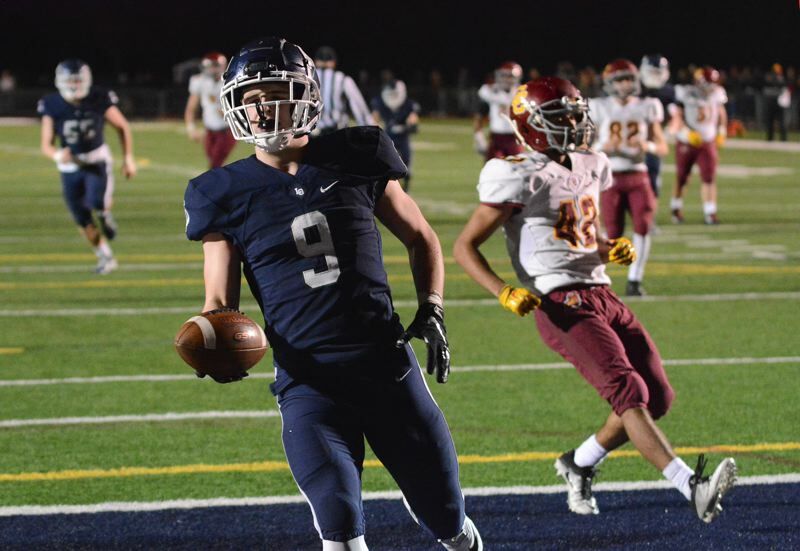 Lake Oswego looked to make quick work of Central Catholic on Friday, starting the game with a 13-play march to the end zone. Laurent fired a pass over the middle to Dukart, who slid off a tackle and gained an extra 10 yards to convert a third-and-14. From there, senior running back Collin Bracken ripped off an 18-yard gain and Laurent found Filkins over the left side for another 17 yards. The Lakers faced a fourth-and-4 as they approached the end zone, but Filkins went low, sliding feet first across the turf to come up with a catch just beyond the marker, then capped the opening drive by picking his way through the middle for a 7-yard touchdown run. Laurent hit Filkins for a 41-yard gain to start the Lakers' next drive, then added a 33-yard touchdown strike to Dukart to put Lake Oswego up 14-3 at the end of the first quarter. The Lakers made it three touchdowns in three drives when Laurent hit senior Keenan DeRaeve and McGuire for back-to-back first downs. DeRaeve moved the chains again, dodging his way through the middle for 16 yards. Filkins finished the drive with a 4-yard touchdown run to put Lake Oswego up 21-3 early in the second quarter. "There was a little bit of nerves coming in, but scoring on that first, second and third drive helped us know what we could do," Laurent said. "We played smart on those early drives and punched it in." Central Catholic climbed back into the game, highlighted by an unlikely conversion on fourth-and-28 when Knighton fired a high pass over the middle to Jaden Fulsher, who put a hand on the turf and stumbled past the 15-yard line, then took on a tackler and pushed just beyond the first-down marker. "Initially, that play called for me to run a crossing route, but I noticed their two safeties were covering other guys. Lake Oswego called timeout and I changed my route to a seam, got past the linebacker, caught the ball and fought for extra yards," Fulsher said. The Rams capped that drive with a 19-yard Knighton-to-Silas Starr touchdown pass, and later in the second period, Knighton hit Starr in the end zone for an 11-yard touchdown that sent the Rams into halftime trailing 21-17. Central Catholic received the second-half kickoff, but was unable to move the ball, and the Lakers boosted their lead to 18-17 on a 53-yard touchdown run by Filkins early in the third quarter. It wouldn't stay that way for long, though. On the ensuing kickoff, Central's Khalen Bostic found a seam through the middle, then wheeled down the right side for an 87-yard touchdown return to climb right back into contention. The Rams recovered an onside kick, but another three-and-out prevented them from a chance at the lead and the Laker defense did the rest, shutting out Central Catholic for the game's final 20:28.